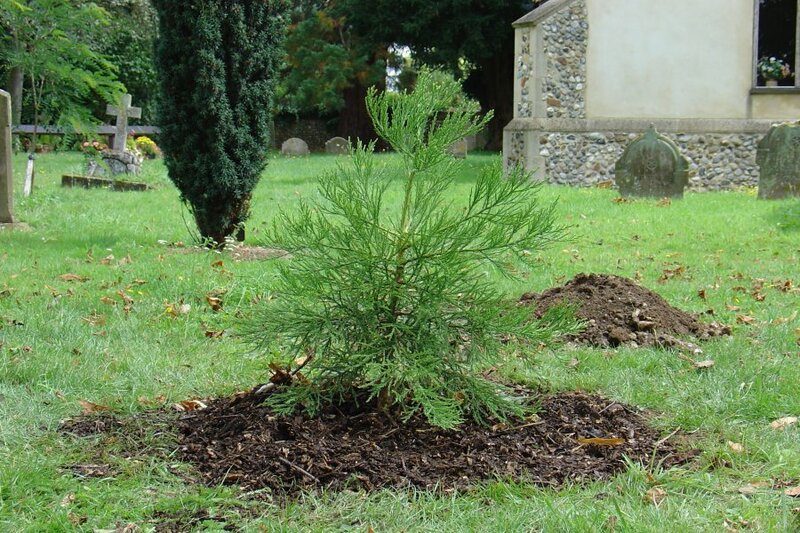 Since planting out trees is now quite popular, why not grow yourself a Giant Redwood! You could grow from a sapling or from seed. As with most plants, the latter is best done in the Spring but I have had germination at other times of the year. There are several stories of people who are growing their own Redwoods on the Tall Tales page. Growing from seed presents a little more of a challenge and requires rather more patience, but need not be too daunting. Firstly you will need to obtain some seeds. The choice is either to buy a pack from a really good seed supplier such as Chiltern Seeds (see their web site: www.chilternseeds.co.uk), or to find your own. You will need to find a good-sized tree. Wellingtonia have not been in Britain long enough for there to be really mature trees; most are only just into their productive stage. The cones need to be around 2" in length or more to have a reasonable chance of having viable seeds. Ideally you should hunt both for some brown, open cones that still contain some seed and also for some that are green and unopened. This will give you the best chance of success. You are not likely to find viable Dawn Redwood cones, these trees have only been grown outside of China for the last fifty or so years and are generally too small and immature. As for Coast Redwood, I have not experimented with foraged seeds yet so I would be pleased to hear from anyone with experience in this area. Once you are home with your cones, place the green ones to one side somewhere warm but out of direct sunlight to give them time to dry and open. This will take some weeks. In the meantime, you will need to prise out the seeds from your brown cones. At this stage many people recommend treating them in a manner called "stratification" in order to improve the germination rate. This involves placing them in cold storage, such as a household refrigerator, for a period of time from several weeks to six months or so. This process is supposed to emulate the conditions that the seeds may encounter in nature, and is thought to encourage them to release chemicals that trigger germination once they are removed for sowing in warmer compost. A mixture of seed and damp sand tied in a muslin cloth may help. There is much debate as to whether this process is effective with Redwood seeds but the dedicated among you might like to experiment. I use tray inserts that have fifteen sections to a standard tray size, or I use fifteen deep square shaped pots that just about fit into the same size tray. In the early days I would use a plain tray without sections and would prick out the seedlings using a desert spoon, but I found that some of the seedlings would die soon afterward because they do not like having their root system disturbed. I very nearly fill each of the sections or pots with compost. I will have prepared this compost by sieving standard compost and mixing in 10 - 20% by volume of vermiculite. I will also add around 10% of horticultural sand, or instead of sand I might use 30% of seed compost (this is usually a gritty mixture, and is often described as John Innes No.1). All this is not essential, and in my early sowings I just used standard sieved compost alone, but I believe the mixture I've described helps improve the germination rate and growth of the seedlings. I then moisten the compost. I tend to water it fairly well as I believe it needs to be quite damp to encourage germination (once they've germinated I would not keep the compost so sodden). Because of the long germination time I believe it is advantageous to mix some anti-damping off compound, I used to use Cheshunt compound but unfortunately this has now been removed from sale. Two or three seeds are placed into each section or pot rather than one each, as I have come to accept that the germination rate is quite low. In fact for seeds that I have gathered myself, rather than purchased, I might put dozens in each pot and will be grateful if I get just one to germinate out of the whole tray. About half of the sections are then covered with an eighth inch layer of compost, the other sections or pots I cover just with fine vermiculite. My theory with the vermiculite is that it does not suffer quite so much with green surface mould. My experience is that germination might be a little better with the vermiculite only covering, but I hedge my bets by doing half of each. I sprinkle a little moisture on the vermiculite, very lightly, but none on the compost topped seeds. I then label the tray with the date and cover with a standard transparent tray cover that has no ventilation holes (although in the hot summer I might leave a slight ventilation gap). Place your tray somewhere warm but out of direct sunlight, I store mine in a shaded greenhouse. What happens next is quite variable due to the low and unpredictable germination rate of Redwood seeds. I find the trays that are in the lowest part of the greenhouse often seem to germinate a little more readily but this may just be chance. Several may germinate within a week or so, some may germinate a few months later, very occasionally a whole tray will eventually germinate. Sometimes though none will come out at all! Do not be disheartened if you experience difficulties with your Giant Redwood seedlings. I have grown hundreds so far yet I still have many that do not germinate, and it took several years to get to the stage of feeling confident about keeping them alive through the first few months of their growth. I would also add that although I have grown hundreds of Giant Redwoods from seeds I have bought, I have found it extremely difficult to germinate seeds I have gathered from trees in Britain. In fact I have had no more than ten successes with my own foraged seeds. I am not sure of the reason for this, perhaps the British trees are just a little too young to have a high proportion of viable seeds. A baby Dawn with seed case still attached Once they germinate I will leave them in for a week or two, possibly longer, but at some stage I will take out the pots that have germinated and put them in a shaded area of the greenhouse to grow on and to be watered from the base of the pot or section. If they are left under the cover much after the first leaves appear I have found that they are likely to die - they need some air circulation. Where I have used sectioned tray inserts, (and here is the sneaky bit), I use a sharp craft knife to cut out the sprouted sections, and thus I am able return the as-yet unsprouted sections to the covered tray. I must say I prefer the individual pots, as they are a good deal deeper and therefore easier to keep at a reasonable dampness in the hot summer months, and they can be left to grow bigger before they need to be re-potted. Giant redwood seedlings are very unforgiving of being allowed to dry out completely so it is very tempting to over-water them. I was losing many seedlings to damping-off until I got the hang of stopping myself watering them as freely as one would water a leafy pot plant in the summer. I now leave it until the pot is feels very light and if possible I apply the water sparingly to the base (with the pot standing in a small saucer), allowing it to soak up. I tend to go by the weight of the pot rather than how damp it looks or feels at the top. If you are growing Coast or Dawn Redwood over-watering is not so great a concern as they will tolerate soggy conditions more readily. The first signs of your newly emerging tree will be a tiny loop of reddish stem, a few millimetres in size, poking out of the compost. When the tiny seedling manages to straighten out, it will be about 1" high and will often still have its seed case attached at the top. This should dry and fall off naturally within a day or so but if it looks like this is not going to happen you can very carefully remove it. The next stage you will see is the top third or so splitting open, typically into four prongs (although I have had three or five appear on some). Within a week or so your little tree will have a dozen or more tiny green branches! 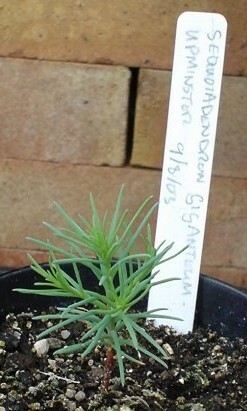 I have occasionally had more than one seedling grow in an individual pot or section. Although it is heartbreaking to do so, I usually feel more inclined to snip off one of them rather than try to separate them. As tempting as the later may be I have found that an attempt to obtain two prized trees usually resulted in two dead seedlings and a sad Ron! You will probably find that Coast Redwood and Dawn Redwood seeds germinate far more readily than Giant Redwood. They are also far less fussy about being over-watered. They will take water-logging fairly well, although Coast Redwood are also quite unforgiving about being allowed to dry completely. They also both grow at a much faster rate as seedlings, in my experience, so you will see your results much sooner. Remember that they can take many months to germinate, so don't give up hope too soon. Generally I will keep the seedlings in my greenhouse through the first winter and until they are at least four inches tall. I avoid exposing them to direct sunlight, and my greenhouse glass is sprayed with diffuser to stop the sun burning the delicate seedlings. As I said before, it is very important not to over-water them as this is how you are most likely to lose them. 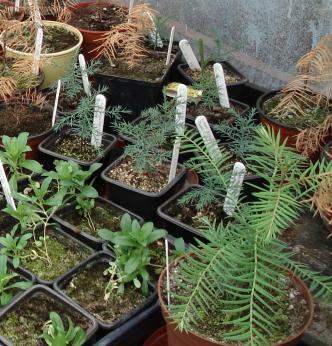 Winter is not really the best time to attempt to keep Redwood seedlings alive, you might find your spring sowings fare better. This may be because any instance of over-watering will fairly quickly dry out past the danger stage for the seedling during the warm summer days. By the second summer (around a year and a half old) I will place them outside and there they will stay through all weather. By this time they will be able to withstand, and probably enjoy, mid summer sun provided that the roots are not allowed to dry out completely. A larger sized pot will help provide reserve moisture for times when you forget or are not able to water. If you were to be away from home and unable to water them then it would be wise to move them to a shaded area. Good luck! If you are gathering seeds from trees yourself just take the larger cones, some brown, some green. Dry the green cones somewhere warm but out of direct sunlight. Use sectioned trays or individual pots; allows you to separate out the germinated seedlings. Store the trays out of direct sunlight. Separate out seedlings as they appear, store out of direct sunlight.